The curious timing of the growing caravan of migrants approaching our southern border so close to the midterm elections has ensured that the problem is being highly politicized. Serious examination of the problem has been drowned out by silly-season opportunists looking to exploit the situation for electoral advantage. A sober, nonpartisan analysis, however, will come to an obvious conclusion: the recurring caravan phenomena, as well as many of our other immigration-related problems, stem from our outdated, contradictory and loophole-riddled standards for asylum. Architects of the relentless push for a borderless America have exploited our laws as well as the generous nature of most American citizens. Our standards for asylum were designed to give protection to those legitimately fleeing persecution. A basic requirement of our asylum law is that those seeking asylum must prove that they have “suffered persecution or fear that they will suffer persecution due to race, religion, nationality, membership in a particular social group, or political opinion.” Think political dissidents in North Korea or those targeted for ethnic cleansing by a ruthless dictatorship. Thanks to the vigilant work of our federal immigration enforcement agencies, simply entering the country illegally is proving increasingly difficult. So what did the anti-borders movement do? Expand the concept of “asylum” into a catch-all back door into the United States. Human traffickers, family members and anti-borders immigration lawyers routinely coach migrants to say the magic words that trigger a “credible fear” claim to grant asylum. Such claims are often impossible to verify. The definition of a qualifying social group has been blurred to include those facing domestic violence or crime in their homelands. 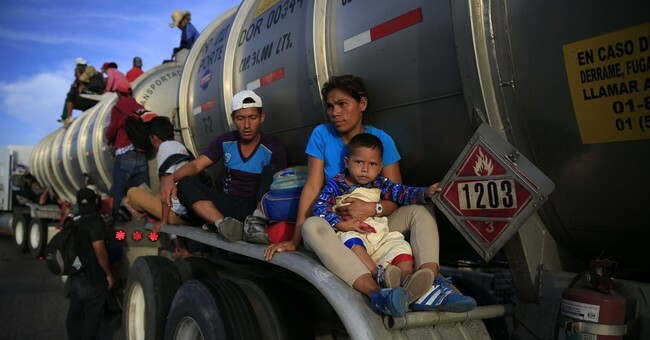 Migrants on the current caravan have freely admitted they seek entry into America because they are looking for better work opportunities—not a qualifying reason for asylum. Current asylum laws are also thick with contradictions and loopholes. Lawyers at the Immigration Law Reform Institute recently identified a loophole in the Department of Homeland Security’s screening program for asylum seekers that should be closed in light of the recent Supreme Court decision in Jennings v. Rodriguez. Since 1996, Congress has allowed the Secretary of Homeland Security immediately to remove aliens arriving at a U.S. border without a passport or other immigration travel document, or who make false statements to an immigration inspector. Congress also allowed the Secretary to apply this “expedited removal” process to immigration law violators in the interior of the United States. But another loophole in the 1996 immigration law has been enabling these latter illegal aliens to avoid immediate expulsion if they tell an inspector that they have a “credible fear of persecution” should they be returned to their home country. By regulation, the inspector is only allowed to interview the alien, and may not conduct a background investigation. If the inspector decides that the alien would qualify for asylum should his or her story be true, the expedited removal order is suspended, and the alien remains in the U.S. to wait for an asylum hearing in immigration court. If the claim is successful, removal stops and the alien stays in the U.S., becoming eligible for a green card after just one year. The problem with our asylum laws is compounded by the “catch-and-release” policy that gives illegal aliens and questionable asylum seekers entry into the U.S. Because of a lack of detention facilities, most aliens who make it to the United States are released into the interior of the country and held to the honor system that they will show up for their day in immigration court that may not come for months or years. Not surprisingly, many of those aliens fail to show up for their hearings. There is a good reason why those claiming asylum are reluctant to show up. Roughly eight out of ten claimants do not win their case and receive a removal order to leave the country. However, in yet another gap in the system, removal orders are not enforced and rely on the alien to leave voluntarily. The honor system in immigration matters does not work. The message is heard loud of clear south of our border: win or lose your case, claiming asylum is a good bet that you will be able to remain in the United States. The consequence of this dysfunctional system is that foreign nationals, not the American people or its government, effectively decide who enters and stays in the country. This system is not sustainable and must change. Attorney General Jeff Sessions has made asylum law reform an emphasis for the Trump Justice Department. His efforts and those of the White House are to be commended. That effort and more is needed as they face a steep headwind in Washington from a well-heeled, politically connected anti-borders movement. There are a number of key areas of immigration policy in need of reform, among them sanctuary laws, chain migration and the lack of a comprehensive physical barrier on the southern border. One of the most effective and most needed steps, however, is to fix our outdated, ineffective asylum laws.